Gun bluing and firearm refinishing! No job too big or small. We have an extensive array of metal finishing services to offer. From simple re-bluing jobs, to complete antique restorations. Is your rifle, shotgun or handgun failing to feed or fire? No problem! From simple cleaning to replacing hard to find parts and everything in between, we'll get back out in the field or on the range. We have all of your optic and sight needs covered. From custom scope mounting requiring drilling and tapping, to swapping out the factory sights on your gun with fiber optic or night sights. We offer muzzle brakes of all types and makes. Cutting to specific lengths if required is included. We can also cut and crown any of your barrels. Custom barrel threading also available. 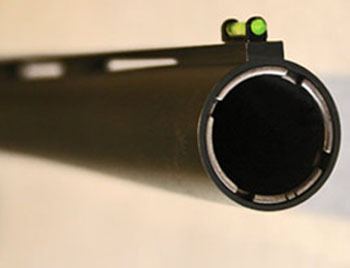 We can install threaded chokes tubes in most guns with fixed chokes to extend the usefulness of them. You don't have to be limited to a specific shot size or range. We also do replacement and upgrade bead changes as well as mid-bead installation. Clean & Test Fire / Stock Alterations & Recoil Pad Installation / Installing New Barrels / Muzzle Brake and Barrel Device Installations / Sling Swivel & Stud Install / Rifle And Pistol Sight Installation / Scope Mounting and Bore Sighting / Cut & Crown Barrels / Straighten Bent Barrels. The services mentioned on this page are just a small sample of our total services offered. Please feel free to call us if you have any questions, or a problem you may be experiencing with your firearm.